O'Farrell has established herself as an impressive novelist, with 7 novels since her debut After You'd Gone in 2000. I Am I Am I Am is an unconventional memoir, recounting 17 times that she or her daughter came close to dying. Few of us have ever come so close to death as O'Farrell, and of course one wonders whether it can be just bad luck, whether she makes bad choices, or whether she is in some way cursed. It turns out that several of these encounters with death are related to impairments she acquired in what was probably her first near-death experience, as a child with a form of encephalitis, which itself nearly killed her. The episodes are not recounted from first to last, but rather they skip around backwards and forwards in O'Farrell's life. We get some understanding of her childhood and her adolescence, as well as some of her marriage, but very little about her jobs, her writing, and her husband. She gives few specifics about where she grew up and who her parents are: she says that she was raised in a seaside town, but does not say where. The result is that her reader gets an impression of her development of her relation to death, in an existentially profound way. Each chapter also skips around in time, going back and forth between the encounter with death, relevant early life experiences, and the meaning of the episode now, from the perspective of her current life. She has been mugged and threatened with death, been stalked by a strange man who later went on to kill someone else, a plane diving out of control, medical problems in pregnancy, and a child's serious allergy. O'Farrell is especially good at portraying the ways that doctors sometimes don't take their patients seriously and ignore crucial information. But she also recounts experience of good health care, and describes how that is for her too. 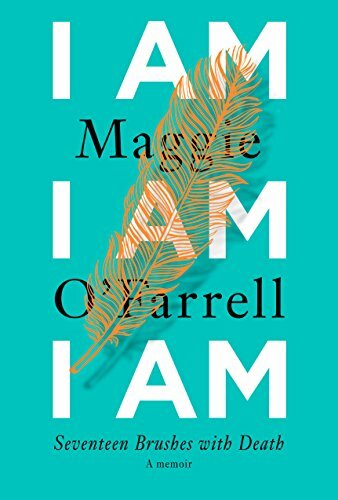 O'Farrell's writing is vivid and emotionally resonant, and explains how she was wild as a child, constantly moving, and how as a parent of 3 children she sees how difficult it was for her mother. The unabridged audiobook performed by Daisy Donovan does a great job of bringing out the energy and compassion of the text.